The Minimal Antibiotic Resistance Platform (ARP) is a tool that can be used for the general dereplication of antibiotics in natural product extracts. This platform consists of fifteen low-copy number plasmids that constitutively express individual resistance genes that target seventeen of the most commonly found antibiotics. This kit is useful for antibiotic dereplication and adjuvant discovery. This kit will be sent as 15 individual bacterial stabs at room temperature. One of the largest healthcare crises of the 21st century is bacteria evolving resistance to antibacterial drugs. Currently, identifying and getting new antibiotic drugs to market is slow and technically challenging. With no new antibiotics on the horizon, efforts have focused on preserving existing ones by blocking resistance with antibiotic adjuvants. Using an antibiotic adjuvant strategy, antibiotics are co-formulated with an inhibitor of resistance (Baym et al., 2016, Drawz and Bonomo, 2010, Wright, 2000 ). The inhibitor blocks the resistance element, freeing the antibiotic to target the bacterium. The Minimal Antibiotic Resistance Platform (ARP) is a tool that can be used for the general dereplication of antibiotics in natural product extracts. This platform was deposited by Gerard Wright’s lab at McMaster University, and consists of fifteen low-copy number plasmids that constitutively express individual resistance genes that target seventeen of the most commonly found antibiotics. When a natural product extract contains a known antibiotic, the antibacterial activity of the producing strain can be reduced in the presence of its cognate resistance gene. It is the substrate specificity of the resistance genes in the platform that allow for conclusions to be made about the antibiotic produced. This kit is useful for antibiotic dereplication and adjuvant discovery. Figure Legend: The Minimal Antibiotic Resistance Platform (ARP) is a library of over 100 antibiotic resistance genes that have been individually cloned in to E. coli and can be used for antibiotic dereplication and adjuvent discovery. 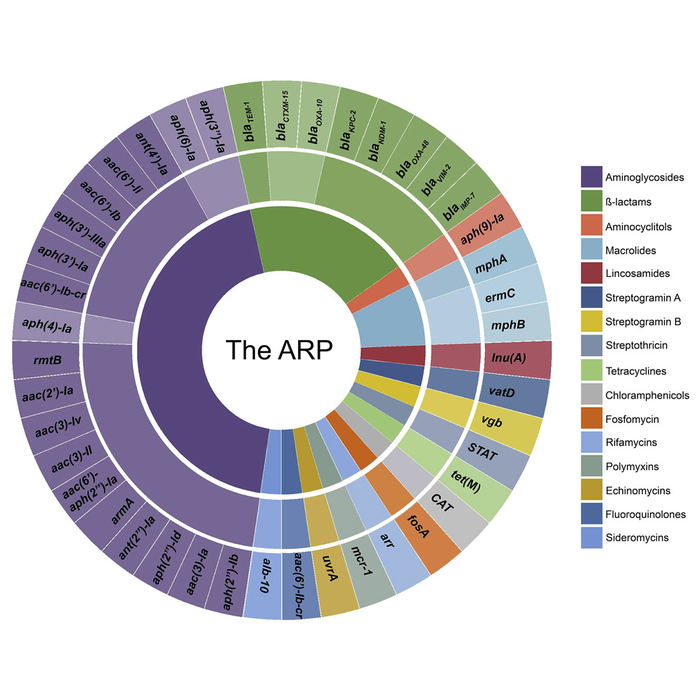 The Minimal ARP is comprised of 15 resistance genes, acting as a first-pass test used to identify which antibiotic class a natural product might belong to.